In November of 1998, Hong Kong Baptist University was the site of the international conference, “Asian Cultures at the Crossroads: An East-West Dialogue in the New World Order,” which I had the great pleasure of attending. It was gratifying to find that essays in this volume, in their evolution from delivered papers to published essays, show evidence of elaboration and refinement of ideas prompted by their initial reception at the conference. (In other words, “Asian Cultures at the Crossroads” was the kind of success that every conference strives to be.) But it occurred to me as I was reading these pieces that anthologies such as this one, which grow out of conferences, generally have characteristics somewhat different from those found in a work generated by its editor, an editor who has the prerogative of carefully structuring the work around a predetermined theme or category by her solicitation and selection of the essays. The essays are generally—and of necessity—more free-ranging, even free-wheeling than those normally found in the editor-generated anthology. This can lead inevitably to both a looser structure and seeming gaps in the conference-generated anthology. 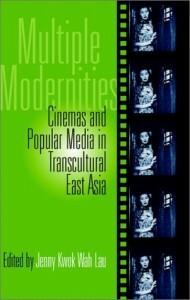 For example, in this case, consider the book’s subtitle: Cinemas and Popular Media in Transcultural East Asia. Cinema is the dominant subject matter of the book, with more than half its essays examining some aspect of film culture exclusively or in part; but a handful do not touch on film in any way. On the other hand, the papers explore a wide range of other aspects of culture, from the popular to the alternative: literature, television, video art, and rock ‘n’ roll. Thus the book provides a broad, if by no means comprehensive, overview of East Asian cultural trends, primarily in the 1980s and 1990s. However, there is another potential problem facing the editors of any anthology: that due to the time lapse between conception of the work and its publication, some of the more topical essays may lose their timeliness. The conference was held, as previously stated, at the end of 1998; Multiple Modernities was published in 2003. While this lag has no effect on the scholarly relevance of the majority of the essays, there are others in which the passage of time is felt. In 1998, for example, many scholars in the West were just beginning to turn their attention to South Korean cinema. Appropriate to their initial timeframe, the two essays on that topic in the anthology seem addressed to a reader without much—or any—prior knowledge of the subject. In the intervening years, however, scholarship on the subject has flourished, and so today’s reader is less likely to be in need of an introduction. (But if one is in such need, s/he could find none better than Gateward’s succinct and incisive overview of Korean film history.) The essay that seems to suffer most from the passage of time is unfortunately the anthology’s first, written by the editor herself. Lau attempts to define the characteristics that distinguish the so-called Sixth Generation filmmakers from the Fifth Generation. While her fundamental argument remains quite useful, given the changes in the careers of Zhang Yuan and other Sixth Generation filmmakers (to which she refers), as well as the emergence of such figures as Jia Zhangke (absent from her discussion), a few of her references seem somewhat dated. But these are minor quibbles. 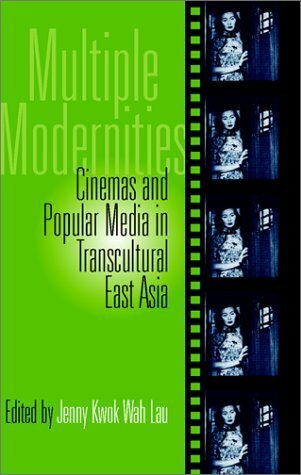 Multiple Modernities is a welcome addition to the growing scholarship in the area of contemporary Asian cultural studies. The book, its editor states, began as a “response to the imminent reannexation of Hong Kong to China in the mid 1990s, the breakdown of the socialist structure world wide, and the rise of the East Asian economic zone” (ix). Although the essays are diverse, they are unified in their exploration of concepts such as “transnational” or “transcultural,” and in their attempt to describe the varying experiences of modernity in the East Asian region. The latter is addressed directly in the first and largest subdivision of the book, under the heading, “States of Modernities.” The anthology opens with Jenny Kwok Wah Lau’s essay, “Globalization and Youth Culture: The Chinese Sixth-Generation Films at the Dawn of the New Century.” If the Fifth Generation directors can be said to have “employed an elegant craft to narrate subversive folklore” (13), the Sixth Generation, Lau tells us, takes a much different tack. “Gone are not only traditional heroes, but also the idea of heroism itself, the traditional form of storytelling, and the fifth-generation international trademark epic that conveys an almost prophetic insight through the use of spectacle” (17). Sixth Generation filmmakers, she states, eschew grand themes and extraordinary characters; instead, they concentrate on the reality of contemporary life: “people living in ways that are a combination of what is imposed on them, what they desire, and what they can afford” (19). Rather than the lush mise-en-scène and sensuous cinematography that marked many of the best known films of the Fifth Generation, the visual style of Sixth Generation films is spare and lean. Lau presents Beijing Bastards, which “tells no story but creates an image of ‘simply living’” and “is full of apparently unrelated documentary footage of the streets” (18), as emblematic. It is precisely “because of these ‘unrelated’ shots and scenes that the film requires a reading distinct from that of [. . .] China’s traditional socialist cinema” (18). Lau explains these diametrically-opposed approaches to filmmaking by noting the forces that have shaped the Sixth Generation. She situates them in the context of historical/political events such as the Cultural Revolution and the Tiananmen Square “incident”; cultural developments such as “scar” and “stream of life” literature and art, and the development of an avant-garde; as well as in China’s economic transformation and the changes that the transformation wrought in film production and distribution. Lau describes a group of young filmmakers who cannot be reduced to a single descriptor such as “dissident” or “disaffected,” but who are consciously attempting to negotiate, as well as reflect, the new reality in which they find themselves. Lau’s discussion of this newest generation of Chinese filmmakers is compelling, but the omissions are puzzling: while the major Fifth Generation filmmakers are identified (Zhang Yimou, Chen Kaige, Tian Zhangzhang, even the lesser-known—among Westerners, at any rate—Huang Jianxin), the only Sixth Generation filmmaker mentioned by name is Zhang Yuan. While Zhang Yuan’s career is discussed at length, there is only passing mention of other Sixth Generation films, such as Postman or The Beads, and that without identification of their director, He Jianjun. Given the centrality of Chinese rock music to Beijing Bastards, the placement of Jeroen de Kloet’s essay, “Marx or Market: Chinese Rock and the Sound of Fury,” immediately after Lau’s seems only natural. But it is more than subject matter that these two essays have in common. Like Lau in regards to the Sixth Generation filmmakers, De Kloet argues against the usual presentation of yaogun yinyue, or Chinese rock, as deriving from a fundamentally dissident impulse, a notion perhaps best expressed in Wang Shuo’s line, “What didn’t happen through June 4th will happen through rock.” Providing an overview of the development of a number of influential bands, analyzing the lyrics of several well-known songs, and situating Chinese rock in relation—rather than opposition—to other music, such as Western rock and the more mainstream commercial Gang-Tai pop (produced primarily in Hong Kong and Taiwan), the writer demonstrates that there are many factors shaping the phenomenon. But De Kloet does not simply suggest that political rebellion is only one such factor; rather, he contends that China’s rebels of rock, like their contemporaries the Sixth Generation filmmakers, are negotiating the complexities of Mainland modernity, not only in the music they create, but in the ways they position themselves. In the next essay, “Reexamining the East and the West,” Mitsuhiro Yoshimoto analyzes the career of the writer Tanizaki Jun’ichiro. Always interested in the interplay of “Oriental” and “Occidental” imaginaries, the author says, Tanazaki created essays, stories, film scripts and novels “whose treatment of geocultural categories and popular culture [ . . . was] serious, sophisticated, and above all imaginative” (54). But unlike many of his contemporaries, who responded to Western imperialism, and the assumption of cultural and racial superiority upon which it was based, by reversing the valences, as it were, Yoshimoto states that Tanizaki “problematizes the essentialized geocultural identities of the East and the West, [. . . arguing] that this dyadic pair of categories has no fixed content or meaning outside of a specific historical context” (64). For those who have not read Tanizaki, this essay should serve as a good introduction; for those already familiar with the writer, the essay offers a new interpretation of the arc of his career. Nonetheless, this is the one essay that seems somewhat out of place in the anthology. Although, as Yoshimoto points out, Tanizaki was one of the first Japanese writers to grapple with modernity and the encroaching influence of the West, he did so during the first half of the twentieth century, while every other essay in the book focuses on work created in its final two decades. Treatment of more contemporary Japanese culture can be found in Yomota Inuhiko’s “Stranger Than Tokyo: Space and Race in Postnational Japanese Cinema.” Yomota takes as his subject the visual and social representation of modern Tokyo in several films: the animeGhost in the Shell, Patlabor, and Patlabor 2 of Oshii Mamoru; and two live-action films, Iwai Shunji’s Swallowtail Butterfly and Sai Yoichi’s All Under the Moon. What these films have in common, the author argues, is their presentation of a Tokyo that is multicultural and multilingual—a hybrid space, a postmodern place. Oshii’s sci-fi anime are set in cityscapes that mix portions of the present day Tokyo and Hong Kong skylines with elements of other cities (e.g., Venice). His cities are “constructions of the high capitalist era [but] are at the same time spaces brimming with the nostalgia particular to ruins” (78). Noting that the films seem to uncover various layers of Tokyo that correspond to specific historical events (e.g., the 1923 Earthquake and WWII air raids), Yomota concludes that they “originate in the peculiarities of a place called Tokyo, shift toward a possible alternative Tokyo, and finally transform into a nationless metropolis that matches nowhere on earth” (80). Iwai’s film is a modern fable set among Japan’s ethnic minorities and immigrants who are presented as living on the outskirts of the city in a shantytown named Yen Town. The Yen Towners are a polyglot and polymorphous group, comprised primarily of Chinese but also many other nationalities, who mostly communicate in their only common language, English. But the author faults the film for omitting Japan’s largest minority—Koreans—which he attributes to the fact that Iwai did not really want to explore the contemporary reality of multicultural Japan as much as to create an exotic view for his young Japanese audience. In contrast, Sai, who is of Korean extraction, has made in All Under the Moon “the first [film] in Japanese cinema to deal with ethnicity head on” (85). The main character of this social comedy is Tadao, a young man whose mother brought him to Japan from his home in North Korea when he was a child. Through his interactions with various characters around him, Yomota says, “the conditions and worldviews of various ethnicities are presented” (87). While some do it more successfully than others, in the author’s opinion, all these films challenge the myth of Japanese homogeneity as they confront the Japanese Other. Yomata has done an excellent job in noting similarities of concern among highly disparate cinematic examples—similarities that might indeed constitute a trend worthy of further investigation. There seems to be, however, some lack of symmetry in his essay. For example, while the question of ethnicity is central to his discussion of the Iwai and Sai films, it is overlooked in his treatment of anime. Yet Oshii’s films are peopled by characters of all races, even though they usually have Japanese names. And while the narratives of these anime revolve around various conflicts, racial or ethnic tension is not presented as a significant cause. Indeed, if his films are dystopic in many ways, they could be argued to present a utopian vision of a fully-integrated world, where members of every race or ethnicity can be found in every stratum of society. In addition to his failure to discuss race and ethnicity in Oshii’s films, his essay also omits any discussion of the visual representation of Tokyo in Sai’s film. Yomata demonstrates that Oshii and Iwai both employ imagery that creates a hyperreal Tokyo. But the reader is left without any sense of what Sai’s Tokyo looks like, only how it is organized. As I mentioned earlier, two of the anthology’s essays address contemporary (South) Korean cinema. In “Discourse on Modernization in 1990s Korean Cinema,” Han Ju Kwak identifies Korea’s particular experience of modernization as the dominant theme of recent Korean film. He describes several elements in the discourse on modernization. With the greater material wealth that modernization brings negative consequences, such as social stratification and environmental degradation. Moreover, since it is identified with the West, non-Westerners necessarily feel that modernization is imposed upon them from the outside. Because of the dominant influence of the U.S. in South Korea for many years, Han suggests that “this phenomenon is particularly relevant to the people of South Korea, who in adopting Western culture have produced a colonial pathology of self-denigration and self-marginalization” (92). Furthermore, the period of South Korea’s rapid industrialization “combined the most direct and severe political oppression [under Park Chung Hee] with the highest economic growth” in the country’s history (92). These factors inform a deep ambivalence towards modernization, an ambivalence that finds expression via three different approaches in films of the last decade. First is the Movement Approach, the designation deriving from the term udong, which the author applies to “all . . . social movements against the existing order” (93). Films utilizing this approach (e.g., Black Republic and A Single Spark), the author contends, present a negative view of modernization by stressing the alienation of labor. Han faults this approach as retrospective rather than progressive, i.e., for failing “to provide a vision for the future” (99). In contrast, the Tradition Approach, represented by such films as Sopyonje and Festival, emphasizes modernization’s destructive effect on traditional Korean culture. But in their nostalgia and regret, the author says, these films fail to acknowledge the negative attributes of traditional culture (e.g., the subordinate position of women). Han clearly prefers the Postmodern Approach, exemplified by The Day the Pig Fell into the Well. While all the films, he says, “can be seen as counter-discourses on modernization/modernity,” only the Postmodern Approach deconstructs the reality of modernization, revealing it to be “fragmentary, incommensurable, and contradictory” (109). Frances Gateward’s essay, “Youth in Crisis,” focuses on the Korean New Wave, which emerged in the mid-1980s. After providing an excellent summary of the history of Korean film prior to that period, she describes the social upheaval of the 1980s resulting from modernization which served as a catalyst for a new approach to filmmaking. Gateward identifies a number of issues that are prevalent in the films of Korea’s New Wave—for example., anti-Americanism and a commensurate Korean nationalism, gender issues, the plight of the white collar worker—but contends that the “overarching characteristic of the Korean New Wave . . . is the influence of youth” (121). Gateward points out that the generation of the New Wave is set apart from previous generations by certain important factors: “They were more heavily exposed to the influence of the media than their predecessors; they were the first generation to come of age without direct knowledge and experience of Korea’s civil war; and . . . they belonged to the student movements that inflamed the nation in the 1980s” (121). Representative of this generation, she contends, are the eponymous protagonists of Chilsu and Mansu. As they experience “urban angst, alienation, cultural imperialism, and marginalization from the mainstream as it progresses without them” (122), the film reflects the social reality of Korea at the time. Yet ironically, the filmmakers of the Korean New Wave, “by constructing controversial narratives in new cinematic forms” (125), were the first to find an audience outside the “Hermit Kingdom.” Together, Gateward’s and Han’s essays provide a fine overview of Korean film, but their pairing would have worked better, I feel, if their order had been reversed. For many years, Hong Kong was referred to as a “barren rock,” a term used to describe its culture as well as geography. But if that designation was accurate in the past, it no longer is. While the rest of the world may know Hong Kong primarily through its cinema, the city actually has a vibrant modern art scene. This is the subject of Hector Rodriguez’s essay, “The Fragmented Commonplace: Alternative Arts & Cosmopolitanism in Hong Kong.” Examining work which ranges from the novels of Xi Xi and the poetry and fiction of Leung Ping-Kwan to the non-mainstream films of Evans Chan, performances of Zuni Icosahedron and video art of May Fung, O Sing Pui, and others, Rodriguez sees in the alternative artworks that have been emerging since the mid-1970s a “culture of the fragmented commonplace.” What unites these artists of disparate forms, he suggests, is a reassertion of the local, through references to a variety of “concrete elements that produce a strong sense of place” coupled with the fact that these “referential contents are depicted as an assemblage of fragments [producing] a collage effect, an impression of intense heterogeneity” (128). In ways similar to Ackbar Abbas in his 1997 book Hong Kong: Culture and the Politics of Disappearance, Rodriguez perceives this aesthetic as a response to the many changes Hong Kong has undergone and continues to undergo in its unique transition to modernity. “Underpinned by the awareness that Hong Kong reality is in danger of being irretrievably lost, [the artists] unfold an archive of fleeting, momentary, and vivid images” (139). But at the same time that it reflects Hong Kong’s particularity, Rodriguez concludes that this artistic practice also embodies trends that should be seen within the broader context of contemporary art worldwide: “a reaction against the abstract tendencies of nonobjective art, and an equally intense urge to avoid ‘classical’ norms of objective realism” (147). Although it leads off the second subdivision of the book, “Postmodernism and Its Discontents,” Dai Jinhua’s essay is an excellent companion to the previous one. In “Immediacy, Parody, & Image in the Mirror: Is There a Postmodern Scene in Beijing?” Dai surveys the development of alternative art in Beijing in the last few decades, from the roaming-artist group Yuanmingyuan Painters’ Village to the theatrical production The Other Shore and the films of the Sixth Generation. Dai, however, takes a more historical approach than does Rodriguez, recording the various events that influenced the emergence of postmodernism in the Chinese capital. These events include the tragic, such as the suicide of the poet Haizi and the Tiananmen Square “incident;” but they also include Jameson’s series of talks at Beijing University during 1984 and the significant socio-economic changes engendered by Deng’s reforms. And unlike Hong Kong, where Rodriguez can demonstrate a similarity of impulse running through the avant-garde from the 1970s onward, Dai points to a clear split between the art of the 1980s (modern) and 1990s (postmodern) in Beijing: the artists of the 1990s “aimed at discovering, recording, and constructing scenes of the here and now” as a direct assault “against the ‘five-thousand-year’ culture of the 1980s” (154). But the most intriguing aspect is her analysis of the use of the concept of postmodernism in China. She argues “that the introduction of the postmodern became one of the parapolitical practices in this transformative period,” sometimes through “deliberate misreading and misappropriation” (158). Dai notes some “relatively pure postmodern attempts [that] took the form of fantasy and parody” (159), such as the film Black Cannon Incident, some of the collections of Cui Jian’s rock’n’roll, and Wang Shuo’s novels, but concludes that these “postmodern duplications and parodies serve less as a bridge between premodern and modern Chinese culture than as a magic mirror that allows one to look into 1990s Chinese society while still avoiding the dazzling light that offends the eye” (164). Or, without recourse to metaphor, she states: “What is absurd is that the introduction and discussion of postmodernism in China in the 1990s not only severed postmodernism from its theoretical and social contexts, but also emptied it of its critical reflection on modernity” (158). The other two essays in this section address the interplay of Eastern and Western popular culture. In “Terms of Transition: The Action Film, Postmodernism, and Issues of an East-West Perspective,” Chuck Kleinhans poses this question: Is the modern action film as propounded in Hollywood and Hong Kong (and elsewhere) simply a transnational genre? To explore this question, Kleinhans examines John Woo’sFace/Off. If this Hollywood film made by a Hong Kong émigré director is representative of the cinematic postmodern, it is only to be expected that “local” (i.e., Hong Kong Chinese) elements are absent because they (like Woo himself) have been absorbed into the “global.” “Considering the action film with specific reference to Hong Kong, we can easily imagine it transformed, with post-1997 Hong Kong film production absorbed within China, losing its dialect, losing its characteristic forms and themes, and even losing its major directors and some of its stars to Hollywood. Gone, absorbed elsewhere, diced and blended in the post-modern space/time compression” (175). The film would seem a quintessential example of postmodernism; yet, Kleinhans notes, Face/Off employs character types, plot structures and themes straight out of 19th-century melodrama. Instead of seeing melodrama, realism, modernism, and postmodernism as products of distinct phases of capitalism—à la Jameson—and thus themselves sequential, Kleinhans points out that the phases are in fact concurrent and overlapping. As Face/Off is illustrative of this point, it should also serve as a warning against the easy assumption of categories. Kleinhans reminds us, with references to Irma Vep, of the West’s propensity to project its own images and desires on Asia. To counter such bias, he outlines a method for comparing the Hollywood and Hong Kong action film in order to locate their differences rather than their commonalities, and thus to recover the “local.” After all, is it really the case that Face/Off is in no way inflected by its Hong Kong Chinese director? Or isn’t it more likely that such elements are simply invisible to the Western viewer? Like Kleinhans, David Desser also examines the future of the Hong Kong film industry in the context of globalization and postmodernism. In his essay, “Consuming Asia: Chinese and Japanese Popular Culture and the American Imaginary,” he compares the recent proliferation of Hong Kong films, directors, and actors in Hollywood, and thus upon the American imaginary, with the similar proliferation of Japanese cinema that began decades earlier. Desser uses this comparison to challenge some of the most fundamental assumptions regarding West and East, center and periphery. Examining not only live action films but anime, TV series, and video games in the context of other commodities such as toys, cars, and electronics, he describes the exchange of products, cultural and otherwise, between the U.S., on the one hand, and Japan and Hong Kong, on the other, since the end of WWII. From his historical analysis, it becomes apparent that any notion that cultural flow is unidirectional—always from the core outward, and always resulting in damage to cultural systems beyond the core—is untenable. Rather, as Desser states, “popular culture circulates, available for both producers and consumers to mediate, extend, rework, rethink, reinvent. Popular culture is both product and outcome, mass culture and folk culture” (180). Rather than regretting the recent arrival of Hong Kong artists and appropriation of Hong Kong forms and styles in Hollywood as indicative of the end of Hong Kong’s unique “local” film culture, Desser reminds us that throughout history, Hollywood has been reinvigorated and transformed by successive waves of immigrants. He ends on an optimistic note: “I take heart in . . . a genuine opening up of U.S. culture and society to these Asian influences, especially on the part of today’s youth” (197). The final and shortest subdivision of the anthology is devoted to “Women in Modern Asia.” In their piece, “Of Executioners and Courtesans,” Augusta Lee Palmer and Jenny Kwok Wah Lau survey a number of Hong Kong films produced in the 1990s and posit what at first may seem a counterintuitive position, namely that many “art films” contain “some surprisingly regressive portrayals of gender” (203), but in many popular genre films, while the representation of women could not be termed progressive, it is at least “more permeable . . . to a renewed vision of gender” (204). In attempting to account for this discrepancy between art cinema “courtesans” and genre cinema’s “executioners,” the authors point to a variety of factors. They first describe the unique (dis)position of Hong Kong Chinese women as that of “triple unhappiness,” compounded of traditional Chinese patriarchy, British colonial paternalism, and capitalism. They note, however, that genre cinema frequently draws upon traditional Chinese literature in which the woman warrior has long been a staple. In addition, Palmer and Lau suggest that the “stronger, more self-determined protagonists” of commercial films might be traced to sociological factors. The “insecurity of life in exile” (217) favored survival over tradition and “survival needs on the societal level . . . facilitated (relatively) nondiscriminatory practices in a broad arena” (217). In other words, for pragmatic rather than ideological reasons, Hong Kong women entered the work force rather than staying at home as in a traditional Chinese family; and increasingly over time, some of these women workers were promoted to positions of power. Hence, the idea of a strong, capable woman is not at all uncommon in modern Hong Kong society, nor in the popular cinema that is its reflection. Since this is the case, Palmer and Lau ponder, why does Hong Kong art cinema represents women so often as dependent, submissive, self-destructive? The authors conclude that these films, produced in the period before the retrocession, “are not about women, but about Hong Kong,” the female protagonists serving as “the focus of conflicts between past and present, tradition and modernity, and more specific geopolitical conflicts between Hong Kong and Mainland China” (206). While the authors’ overall thesis has merit and their proffered explanations persuasive, they tend to overstate the evidence. Their characterization of the portrayal of women in the films of Clara Law, Stanley Kwan, and Wong Kar-wai, chosen to exemplify Hong Kong art cinema, strikes me as somewhat problematic. In Rouge, Kwan did indeed create the quintessential courtesan. But to suggest that Law’s Farewell China “[locates] the blame for the tragedy” with which the film ends “in Li’s [the female protagonist] transgressive ambition” (209) does not accord with the totality of the film (it is Li’s husband, Zhou, who wants his wife to emigrate to the U.S.; Li goes reluctantly and even begs to be allowed to return home after her first few months there. If there is a “transgressive ambition,” it is surely his). To further state that other films by Law merely “repeat the narrative of the self-destructive woman who chooses to transgress social mores and is therefore punished” (209) may be useful when applied to, say, The Reincarnation of Golden Lotus, it does not do service to the complexity of female representation found in, for example,Temptation of a Monk. And I doubt that many would agree with the authors’ estimation that the female characters in Wong’s Days of Being Wild “are as flat as paper dolls” (207). On the other hand, in their cited examples of genre films, Palmer and Lau fail to acknowledge the possibility of factors at work other than those they describe. For instance, of the three films (or film cycles, more properly) they analyze (Swordsman II, The Executioners, and Huang Feihong/Once Upon A Time in China), two are the products (as director and/or producer) of Tsui Hark, a filmmaker who throughout his career has shown a particular penchant for strong female characters. Thus, Asia and Invincible and Thirteenth Aunt/Aunt Yee arguably owe more to their auteur than to Hong Kong commercial cinema in general. All in all, Palmer and Lau remain fairly pessimistic about gender representation in Hong Kong cinema. While they concede the significant number of women filmmakers Hong Kong has produced over the years, they contest Teo’s position that the very presence of these artists and the number of woman-centered films produced represent a positive trend. Even if Teo’s optimism is, as they say, “simplistic,” that does not justify their condescension towards those filmmakers: “just as the nimble fingers and long hours of underpaid female workers were essential to the backstage labor which produced Hong Kong’s public economic miracle, women have played a crucial role in Hong Kong filmmaking, not only as actresses but also as screenwriters and directors” (205). It is hardly apt to liken such filmmakers as Tang Shuxuan, Ann Hui, and Cheung Yuen-ting to “the little Chinese seamstress” or factory girl of Hong Kong’s postwar industrialization. The only article in the anthology addressing contemporary media in Taiwan is Lin Szu-Ping’s “The Woman with Broken Palm Lines,” which examines a popular albeit controversial television series of the 1990s. Since the series deals with Chinese folk beliefs, the author traces the belief system from the earliest period of Chinese philosophy to contemporary fortune-telling (suanming). She explains that according to traditional Chinese palmistry, a woman born with broken palm lines (duan zhangwen) is considered accursed, someone who will bring bad fortune to her family. The woman of “good fortune,” according to suanming, is said to be pure, gentle, clean, and noble—in other words, the docile, self-negating feminine ideal of Chinese patriarchy. The woman with broken palm lines is her opposite, possessing characteristics that are traditionally described in pejorative terms. But, Lin notes, “these descriptions apply, in modern terms, to women considered independent, ambitious, intelligent, and sexually attractive or active” (224). For that reason, the author contends, this TV series about a woman who resists the “fate” of her broken palm lines provides a locus for exploring evolving ideas of feminine subjectivity. Grounded in the works of Foucault and the feminist scholar Judith Butler, Lin’s study seeks to demonstrate that the series’ protagonist exemplifies the way the female subject is constituted in modern Taiwanese culture. In so doing, she does not limit herself to textual analysis of the series “Shunniang: The Woman with Broken Palm Lines”; she also examines issues of the series’ production, promotion, and reception: for example, the decision to focus on Shunniang exclusively (rather than on multiple characters as in the novel from which the series was adapted); the difficulties in getting the series produced until a female executive at the network chose to support it; and the positive and negative audience response to the series. Many of the other contributors to the anthology deal with aspects of Asian culture, such as films or novels, which receive fairly wide distribution beyond their place of origin. Lin, however, has provided insight into an aspect of Taiwanese culture to which few outside the island would have access.